The dimensions of Whitehaus WH3018-SBLU are 36” x 18” x 10” inches, and its weight is 75lbs. That aside, this sink is elegant and durable. This sink is rectangular, and so all sides have the same depth. It does not taper on sides regardless of the method of installation that you choose, seeing as its depth is consistent. It is curved at the corners to prevent sharp projections that could harm you when installing it. The top coat of the sink is shiny; a feature that is touted to last a lifetime. 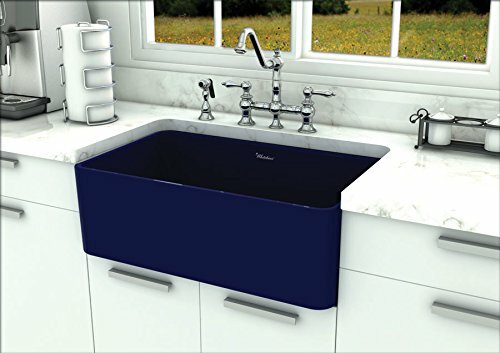 The finishing is in sapphire blue, but you can also get the sink in black, biscuit, and white. 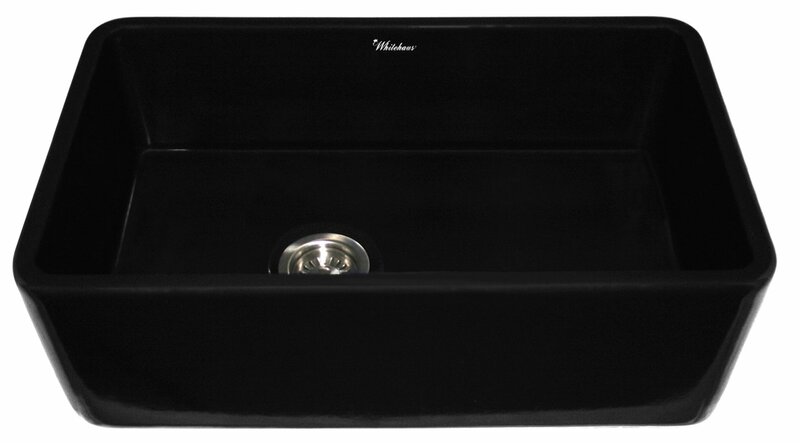 The sink is handmade in clay, molded into shape then heated to produce the elegant, smooth finish that you see. The manufacturer then applies a finishing of their choice. The sink is clay-made and lead-free, and so it appeals to those keen on going green. It has been heated in extremely hot kilns, and so this sink will endure high impact for a long time. The bowl measures 34” x 16” x 8½”, which is quite deep for kitchen and laundry purposes. Installation is not as easy, as the material is a bit delicate. First, it is quite heavy, and so you will need a sturdy surface that can handle that weight, lest it cracks under its own weight. The second thing to note is that tightening the garburator flange too much may cause the clay-made sink to crack. The manufacturer sends it out with a manual that explains the dos and don’ts to help you put it up without accidents. If you can’t do it, it’s best to hire someone who can install it well. 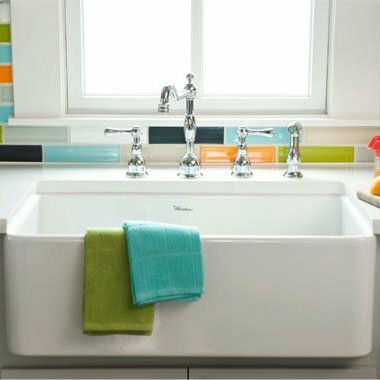 The finish on the top surface is smooth, making this sink a delight to clean. The colors will not fade even when exposed to the sun, and clay will not react with water. Abrasion with aluminum plates and foil could leave marks, but they are easy to clean with non-abrasive cleaning tools. Some reviewers say they have had this sink for over 3 years without any issues. The sink is as close to perfect as you can get, but there is a minor downside. The bottom is ridiculously flat, so you may have a hard time draining water completely. Luckily, you can always solve this by using a sink grid. Whitehaus WH3018-SBLU is high-end, and so is the price. You will need to be keen with the installation process because failure to get it right could cost you. The warranty is 12 months, and it does not extend to incorrect handling. The instruction manual explains every detail of installation.